I recently attended a local meetup event hosted by Tim Lyle on behalf of Lehigh Valley Tech. 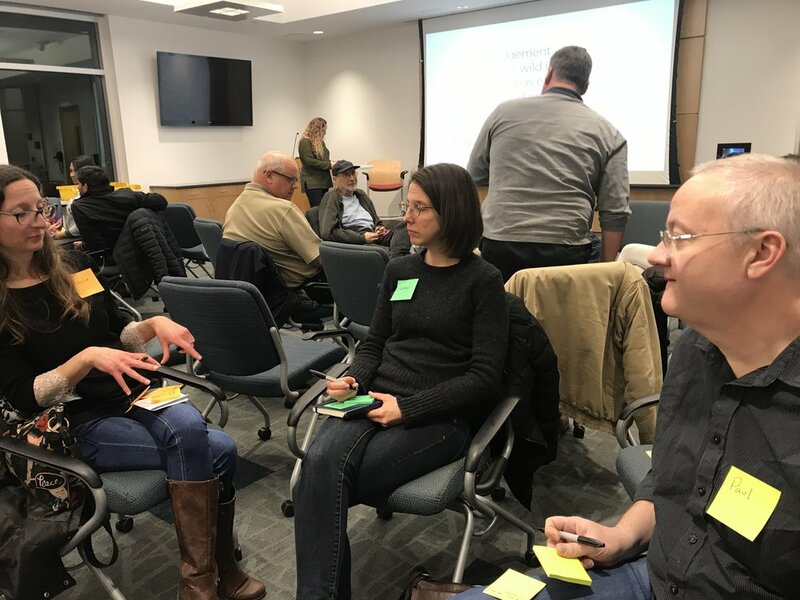 The event was called Hands On: Design Thinking by Shannon Varcoe, Founder of ZYX Sticks and Innovation Programs Director at Lehigh University. Here, I summarize the event’s activities and take aways. I didn’t get notes from everything, because I was engaged in the topics and activities. These were some things that stood out to me. Now, substitute the 1 with a floor stomp. What we learned: failed fast, but got faster as we corrected and practiced. The failure helped us to adjust quickly, so we didn’t waste time before improving. Draw a vase. Most drew a very similar sketch. Draw a way to enjoy flowers in your home. This was too broad (mine was based on enjoying them not by sight by by smell…) - but we also came up with tons of very different ideas. What we learned: there is a sweet spot between constraints being too broad and just enough to come up with focused ideas that solve a real problem. Design in messy. Constraints are important, and are often (i.e. almost always) not defined well enough. Small group assignment: How Might We improve the movie theater experience? At each stage, we struggled with scope until Shannon helped us push into one direction from our broad and quick “research”. Something that sounded so simple got very complex very fast, and it was clear at each step that we needed to scope and then scope again. One technique Shannon introduced was to consider how to make what people like about an experience even better, rather than jumping to fixing a bad piece of an experience. This made us think of our problem area in a new light. The definition of what to spend time solving became clearer as the constraints were defined. As our small group tried to stop ourselves from jumping to solutions right away, we kept running into more what-ifs. This proved that we had not scoped it out well enough yet, and needed some more focus. Out of focus we find patterns. Out of patterns we find focus. The place was packed, and everyone was engaged the entire time. In fact, many wanted even more time to work. We had each concluded or reinforced our belief that the most important part of the design process is defining the problem. I loved the breadth of skills, talent and perspective that was present and engaged at the event. In fact, I met very few whose role is that of what most think of as a Designer. Our small group included a bright 11 year old girl who brought valuable insight into our conversation, and some others I spoke with were anything from Business Analysts to Tech specialists. This type of thinking is so important in all aspects of business and creativity, and gave me a refreshing way to look at things, in addition to broadening my local network.